Social media marketing is not a luxury; it is a necessity. The greatest feature of social media is that it is up-to-the-minute: as a result, it is crucial to ensure that your online presence is not only current today, but is kept current tomorrow. The world’s top search engines have integrated social media results into their search algorithms, and so it is necessary to ensure that no page or profile is left behind in your comprehensive digital presence. With a social media strategy that is carefully optimised, your company will get the best results to increase your brand exposure online and to engage with your target audiences. Social media strategy is not simply about having beautifully-designed posts; it is also about monitoring them, engaging with respondents and keep them coming back for more. 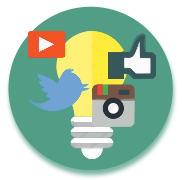 With our proven processes, we integrate social media within your business model to grow your audience and attract potential clients. We develop a complete social media strategy and campaign calendar in direct consultation with you, all based on the size, needs and projected growth of your business. Very often, starting a social media campaign is the most difficult part. Our team of professionals is experienced in setting up your online presence from the very beginning, keeping it engaging and portraying a professional image from day one. A social media marketing strategy does not mean simply having profiles on social networks such as Facebook, LinkedIn, Twitter and Google+. We research your target audience to find out exactly what they enjoy, when they enjoy it and how to build an online relationship with them that they will keep engaging with. The most long-lasting aspect of social media campaign management is feedback to you. We will report back to you and your business about progress on your digital footprint, growth, engagement and effectiveness of the means we use to get your message out to your audience.